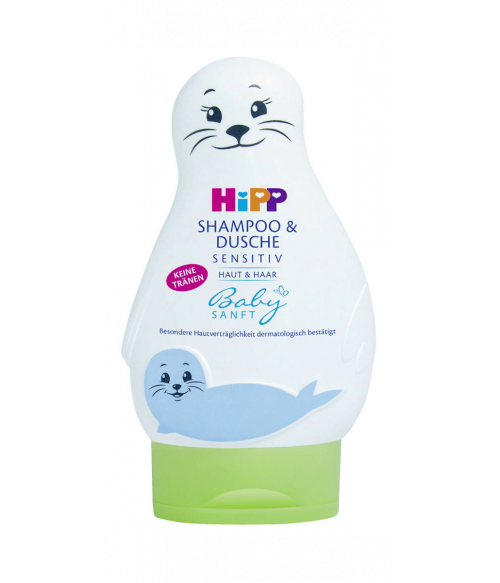 HiPP SENSITIVE shampoo & shower is particularly kind to the skin and especially for sensitive skin and for the development of the hair of children. The mild shampoo does not sting the eyes and the hair can be easily after washing combed. It is pH neutral and preserves the natural acid mantle of the skin. Developed to minimize allergy risks without mineral oils. No fragrances that lead to reactions. Soap-free. Only mild to the eyes. Ingredients: Aqua, Cocamidopropyl Hydroxysultaine, Glycerin, Sodium Lauroyl Glutamate, Sodium Chloride, lauryl glucoside, coco-glucoside, glyceryl oleates, Prunus Amygdalus Dulcis Seed Extract, panthenol, tocopherol, Acrylates Crosspolymer-4, Hydroxypropyl Guar Hydroxypropyltrimonium Chloride, Polyquaternium-10, glyceryl Caprylate, Propylene Glycol, Sodium Citrate, Sodium Levulinate, Lactic Acid, p-Anisic Acid, levulinic acid, Hydrogenated Palm Glycerides Citrate, and Parfum.